I can be a little jealous, right? 🙂 It looks beautiful. I went for a walk about late last night in Stockholm. 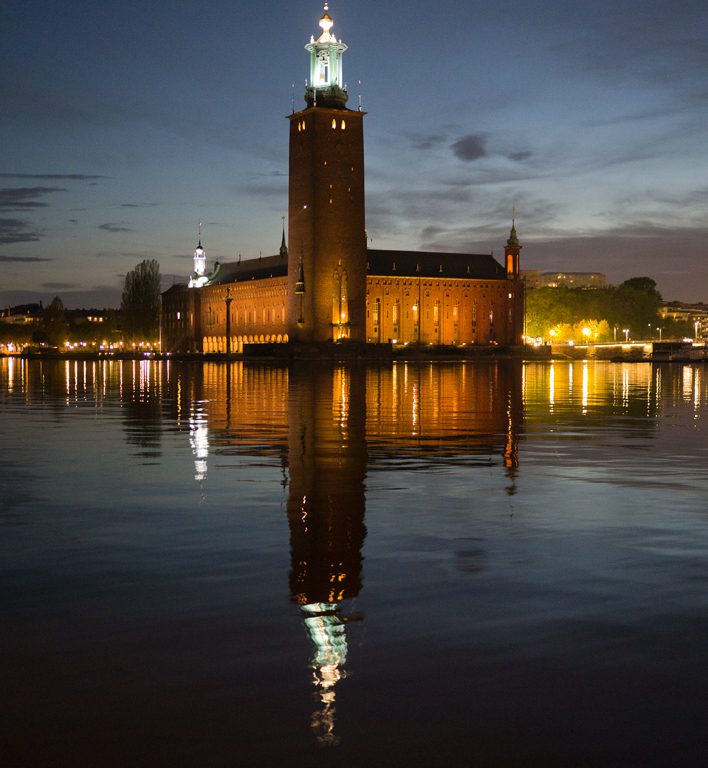 Eventually I found myself at Stockholm City Hall. Discovered that yes Stockholm is on an archipelago and that meant I did end up getting a little lost for a short while. After roaming along a ridge trail, across the water and through old town at night, past the government buildings, through a shopping district, past the central station, then to City Hall and then mostly retracing my steps, I was tired ! But I eventually found my way back to the Hotel Rival. There were lots of well lit, well segregated from road traffic and well populated trails. It was a fun experience and I never felt in an danger at any time. I took this shot with both the GH2 with the 20 f1.7 and the D700 and the 50 f1.2. And the GH2 came out looking better, to my eyes. There was more detail and the building itself looked sharper. While I was out I also took some panorama shots. Will try and put those together in “Hugin” later and see how they come out.